The Body of Christ is a living, corporate composition of all the believers in Christ. Likewise, New Jerusalem is a living, corporate composition of all God’s people throughout the ages. Here is another excerpt from Affirmation & Critique*. God created human beings as vessels unto honor prepared unto glory…(Rom. 9:21, 23). Sadly, humankind fell into sin. To sin is to fall short of God’s glory and thus to express sin and the sinful self and to love the glory of men more than the glory of God (3:23; John 5:44; 7:18; 12:43). But Christ’s redemption has fulfilled the requirements of God’s glory (Rom. 3:24-25; Heb. 9:5; cf. Gen. 3:24), and through the gospel of the glory of God, God has called us by and into His eternal glory (2 Cor. 4:4; 1 Tim. 1:11; 1 Thes. 2:12; 1 Pet. 5:10; 2 Pet. 1:3). By God’s mercy and grace, we have believed into Christ, and now the all-inclusive Christ dwells in us as the hope of glory (John 3:15; Col. 1:27; 3:4, 11; 1 Cor. 15:45) for us to experience, enjoy, and express. 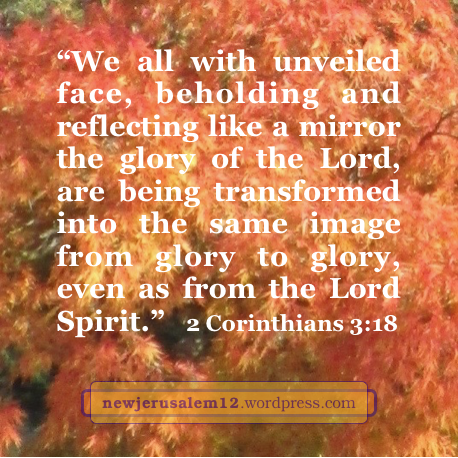 Day by day, as we behold and reflect the glory of the Lord, we are being transformed into the Lord’s image from glory to glory for the expression of God in Christ (2 Cor. 3:18). Each of us is a vessel created “unto glory.” God will “make known the riches of His glory upon vessels of mercy, which He had before prepared unto glory” (Rom. 9:23).The word unto indicates a goal and implies a process. 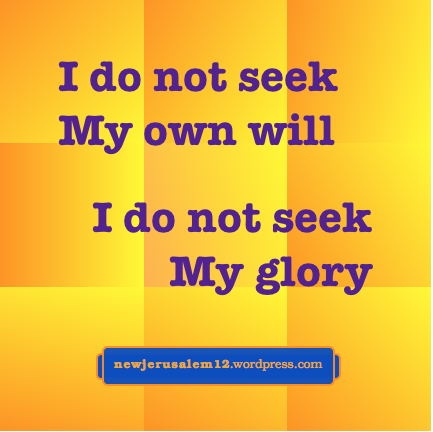 God’s goal in creating vessels unto glory is New Jerusalem, because in eternity there are no individual glorious vessels, there is only the one great corporate vessel, New Jerusalem—“the holy city, Jerusalem…having the glory of God” (Rev. 21:10b-11a). We are all vessels unto glory to become members of this glorious city. The process “unto glory” is well presented in 2 Corinthians 3:18, “We all with unveiled face, beholding and reflecting like a mirror the glory of the Lord, are being transformed into the same image from glory to glory, even as from the Lord Spirit.” Eventualy the glory in us becomes the glory of New Jerusalem. “From glory to glory” denotes the steps of a gradual process. This process is accomplished by the Lord Spirit but He requires our cooperation. We turn our hearts to the Lord and behold Him (2 Cor. 3:16-18), so that the Spirit can impart the glory into us. This is our path to New Jerusalem. 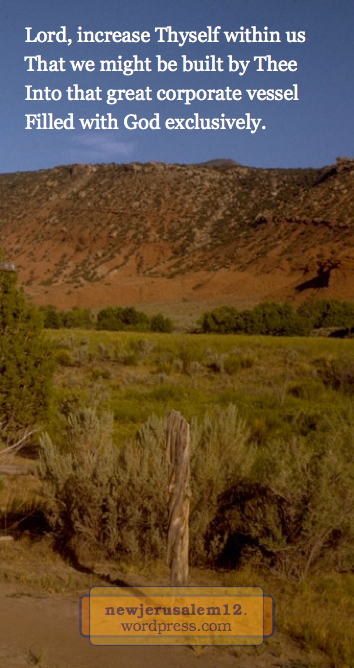 God’s eternal purpose, the subject of the song we are reviewing, depends on God’s divine, eternal life. God’s plan is to build together a group of people as His dwelling place, consummating in New Jerusalem. This must involve humans but it cannot be carried out by the created human life. Because God’s purpose depends on the divine life, God put the created man in front of the tree of life (Genesis 2:8-9). This tree is a picture of Jesus Christ, who is the life (John 11:25). When Christ is our life and to the extent that we live because of Him, we participate in the realization of New Jerusalem. Thus the song speaks of being built in life and knit in love, as in Ephesians 4:15-16. The result of His growth, His increase in us is a corporate vessel filled with God and expressing God. The ultimate step of this is New Jerusalem. ____All Thy goal in us attain. New Jerusalem is the final stage of the corporate vessel, filled with and radiating God’s glory. Lord, we’re wholly for Thy purpose, all Thy goal in us attain. We are reviewing a song about God’s eternal purpose. 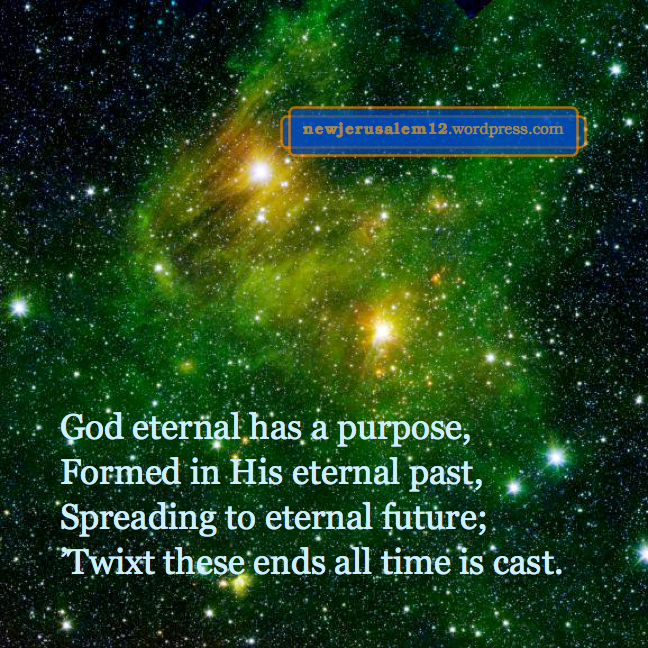 God’s purpose has been in Him from eternity past and it points to New Jerusalem in eternity future. God’s work is not a reaction to the problems in the universe. He solves the problems by doing everything “according to the good pleasure of His will” (Ephesians 1:5, 11). 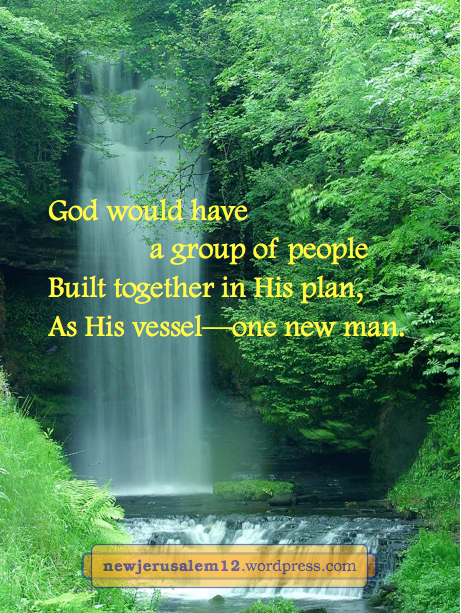 God’s purpose is stated in the second verse of this song: He wants a group of people built together as His vessel, one new man. This is Colossians 3:10-11, we “have put on the new man…where Christ is all and in all.” Ultimately, New Jerusalem is this corporate vessel. ____As His vessel—one new man. ____For His joy and to His praise. The Triune God—Father, Son, and Spirit— work together in us (song, verse 3) resulting in praise to God (end of verse 2). 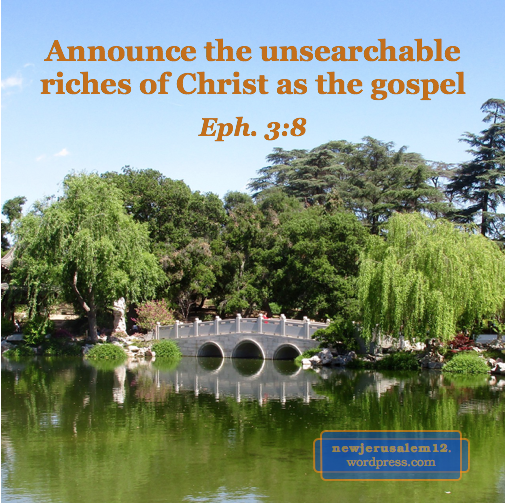 This triune working and the resulting praise is presented in Ephesians 1. Verses 3-6, 7-12, and 13-14 are associated with the Father, Son, and Spirit. Each of these three sections ends with the praise of His glory. Ultimately the glory, and the praise, will be New Jerusalem. ____To dispense Himself to us! God created man in His image with body, soul, and spirit (1 Thessalonians 5:23). God’s creation was for His purpose, for Him to come into man, to be life to man, to be formed in man (Galatians 4:19), and to make home in man (Ephesians 3:16-17). All of this points toward New Jerusalem. Praise Him for this marvelous plan.